When 5-month-old Sebastian de la Cruz stopped breathing while in the backseat of his aunt's car on Thursday afternoon, Pamela Rauseo sprang into motion, performing life-saving CPR twice on her nephew as a photographer captured the frantic scene with his camera. The infant is now in stable condition at Jackson Memorial Hospital. "I was just freaking out," Rauseo, 37, told TODAY.com. "I don’t have words to describe the sheer terror that you feel. I really felt that we were going to lose him." 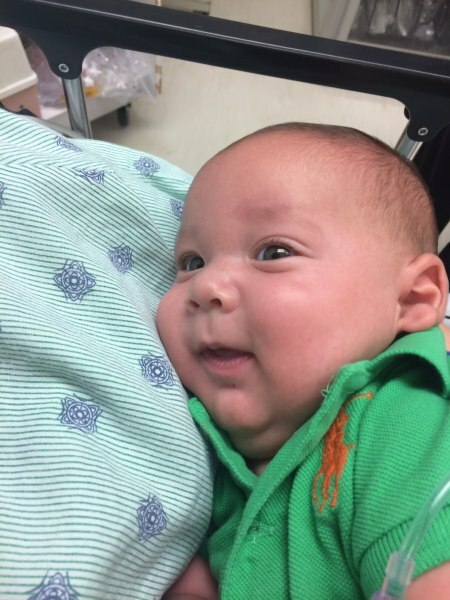 The infant’s now stable condition comes as an incredible relief to family members, especially Rauseo, who panicked when Sebastian suddenly stopped wailing while they were stuck in heavy traffic on a Miami highway. Turning around to check on him, she realized that Sebastian, a preemie born with respiratory issues, was pale and unresponsive. Pamela Rauseo, 37, performs CPR on her nephew, five-month-old Sebastian de la Cruz, after pulling her SUV over on the side of the road along the west bound lane on Florida state road 836 Feb. 20. "I tried to dial 911 but was too stressed and nervous," she said. "I got out of my car screaming for help." Miami Herald photographer Al Diaz saw the car in front of him stop, but didn’t think much of it until he heard Rauseo’s screams. He ran over to her, then jogged through traffic in pursuit of a police officer who could help. A veteran photographer, his first reaction was to lend a hand instead of capturing the moment with his camera. “In this kind of situation you have to be a humanitarian first and then you go to journalism,” he told TODAY.com. Meanwhile, Rauseo dropped to the ground on the side of the highway and started performing CPR on her nephew, a skill she learned when one of her three kids briefly stopped breathing as a small child. More help had arrived as well: Another driver, Lucila Godoy, left her young son in the car while she assisted Rauseo by making phone calls. "She was a great source of support," Rauseo said. Baby Sebastian at the hospital after he stopped breathing on Thursday afternoon. Diaz found police officer Amauris Bastidas and brought him to the scene, while more officers caught in traffic made their way over. At that point Diaz pulled out his camera to snap photos of the drama as it unfolded. The CPR worked — but only momentarily. 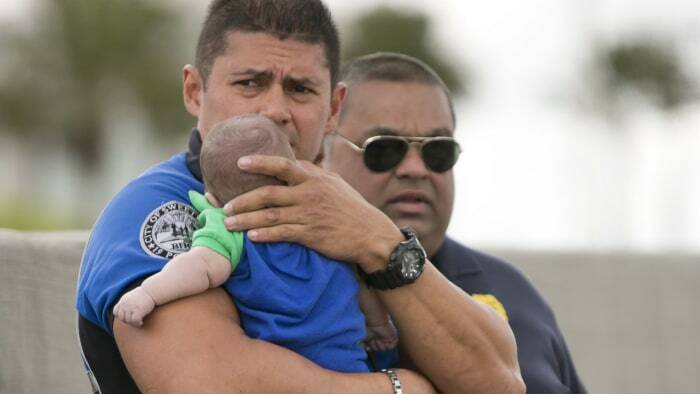 When Bastidas lifted the baby into the air, he stopped breathing and crying once again. Worried she might lose her sister's child, Rauseo performed CPR a second time, while Bastidas helped with chest compressions. This time Sebastian was able to breathe on his own until the fire rescue team arrived to take him to the hospital. The baby will remain at Jackson Memorial for testing until doctors are able to determine what caused his loss of breath. "I wasn’t calm until we were in the hospital and the doctors took over," Rauseo said. Sweetwater officer Amauris Bastidas keeps a watchful eye waiting for paramedics after aiding a 5-month-old Sebastian de la Cruz. Diaz’s photos of Rauseo breathing life into her purpleish nephew have since spread across the Internet. All the attention in the midst of such a traumatic episode has been overwhelming for Sebastian's mother, Paola Vargas. "For her to see the images of him purple and not breathing, it's a shock to your senses," Rauseo said. "We're taking it one day at a time." Tune in to NBC Nightly News Friday for more on the dramatic story.